Amélia was a real woman. Ataulfo was known for “directing” with his white handkerchief. Here he is pictured with Jacob do Bandolim. 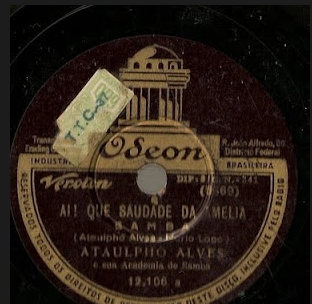 “Ai, que saudades da Amélia” was an unlikely Carnival sensation in 1942, mostly thanks to Ataulfo Alves’s conviction that the rather somber-sounding samba was destined to be a hit. Alves persisted in recording and furiously promoting the song in spite of protests from his partner Mário Lago, who had written the original verses. Alves expanded upon and changed Lago’s lyrics to an extent that upon hearing the final version, Lago told Alves that he didn’t want his name associated with the song. But Ataulfo was confident in his poetic prowess, and stuck by the song, enlisting publisher Emílio Vitale to help him get it recorded. 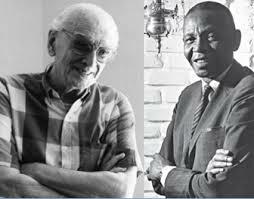 The pair peddled the samba to some of the most famous radio singers of the time: Moreira da Silva, Cyro Monteiro, Carlos Galhardo and Orlando Silva. All of them rejected it; Moreira da Silva remarked that the samba sounded more like a funeral march to him. So Alves decided to record it himself. This was a gamble: it was still rare at the time for a samba composer to record his own songs. Alves had released “Leva meu samba” and “Alegria na casa de pobre,” but considered this more of a fluke than anything else. But the executives at Odeon gave the go-ahead to Alves, who swiftly sought out Jacob do Bandolim to accompany him. When Jacob protested that he didn’t have a mandolin on hand, Alves ran over to Rua do Senado and bought a cheap cavaquinho that Jacob played on, improvising the now famous introduction. Many Brazilians embraced the song as representative of the ideal Brazilian woman. Others were disgusted by it, and it can still stir up controversy. It’s worth remembering that song was inspired by a joke, and definitely carries a bit of that tongue-in-cheek tone: In a 1953 interview with Radiolândia, Mario Lago revealed that the inspiration for Amélia came from the singer Aracy de Almeida’s brother, the percussionist Almeidinha, who would joke about the former family maid, Amélia: “Ah, Amélia, that was a real woman – she washed, ironed, starched, cooked and took beatings, and never complained.” According to Cabral, Amélia dos Santos Ferreira lived in Realengo, Rio de Janeiro, until her death in 2001, at age 91. 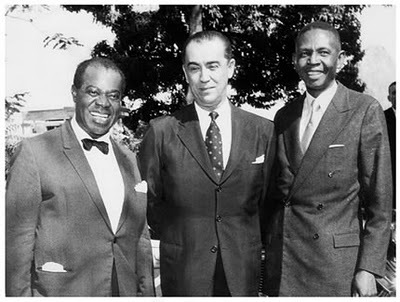 Ataulfo Alves (right) with Louis Armstrong and Juscelino Kubischek at Catete Palace, 1960. Alves recorded “Ai, que saudades da Amélia” in November 1941 and it was released in January ’42, with Cartola’s “Não posso viver sem ela.” After its release even Lago was convinced the song had something special, particularly because it was well received by the crowd of musicians, composers and adepts who gathered at Café Nice. But the disk didn’t sell well. So Alves stepped in again, this time with a fantastically executed show that won over two of the most powerful radio hosts of the time. One of them, Julio Louzada, dedicated an entire Sunday afternoon to “Amélia,” playing it dozens of times on repeat with a few pauses for interviews about the song; suddenly everyone wanted the album. Ataulfo Alves was born to a poor family in Miraí, Minas Gerais, on May 2, 1909. His father worked in the coffee fields, played guitar and accordion, and was an extemporaneous speaker. Ataulfo told MIS that by the time he was eight he was out singing and improvising with his father, who was known as “the Captain” around town because his way with words led the plantation owners to effectively make him their deputy. But Ataulfo’s father died when Ataulfo was ten, and the family struggled to make ends meet. Soon Ataulfo went to work, first as a milk boy, then as an ox driver, luggage carrier at the train station, shoe-shiner, lunch-box carrier and message delivery boy. He moved to Rio in 1927, when a doctor from Miraí invited to work with in a clinic he was opening in the capital. The experience with the doctor and his family resembled indentured servitude, and Alves ended up finding a job at the compounding pharmacy Farmácia e Drogaria do Povo, first as a window-washer and then in the lab, mixing medications. 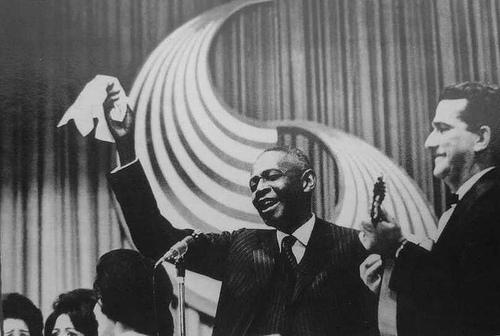 At the same time, Alves began going to the rodas de samba in his neighborhood, Rio Comprido, and eventually organized his own group, remarking, “I could make sambas just like I could make medicine.” One of the most successful samba composers of the 1940s and 1950s, Alves’s poise helped him throughout his career. He was known for being confident, elegant and refined, and for his loyalty to the populist president-dictator Getúlio Vargas. Alves died on April 20th, 1969, just a couple weeks shy of his 60th birthday. Main sources for this post: Ataulfo Alves: Vida e Obra by Sérgio Cabral, and A Canção no tempo: 85 anos de músicas brasileiras, vol. 1, by Jairo Severiano and Zuza Homem de Mello. “Aurora” was one of the top hits of Carnaval 1941, and is still often mentioned among the greatest Carnaval “marchinhas” of all time. The song lists major status symbols of the time — an air-conditioned apartment, with an elevator and a doorman — to remind Aurora of all she gave up (not to mention the possibility of becoming a “madame”) by not being true to the song’s protagonist. After the 1950s, marchinhas were pushed out of the Carnaval spotlight by samba-enredos, which were written for and performed by Rio de Janeiro’s beloved samba schools. What’s more, the often biting political commentary woven into cheerful marchinhas ensured the disapproval of the military dictatorship that took over in Brazil in 1965, further stifling the genre. Mário Lago, born in Rio de Janeiro in 1911, was a lawyer, poet, composer, lyricist and actor, and one of the most highly regarded songwriters in Brazil in the 20th century. Aside from “Aurora,” his most famous songs include “Ai, que saudades da Amélia” and “Atire a primeira pedra,” both written with Ataulfo Alves, “É tão gostoso seu moço,” with Chocolate, and “Numero um,” with Benedito Lacerda. He also acted in a number of movies, including Glauber Rocha‘s classic Terra em Transe. 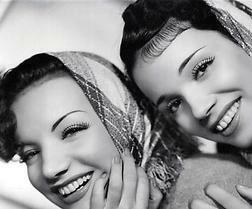 Roberto Roberti, born in 1915, also in Rio de Janeiro, composed marchinhas and sambas — including a number of hits sung by Carmen Miranda — and was one of the founding members of the Brazilian Composers Union. Main source for this post: A Canção no Tempo: 85 Anos de Músicas Brasileiras, Vol. 1: 1901-1957, by Jairo Severiano and Zuza Homem de Mello.